If you’re looking for great vacation spot, romantic getaway, or just a relaxing weekend then Bear Paw is the place for you! Whether it’s fishing, swimming, water sports or just cruising around the lake on a boat soaking up the beauty ….Lake Hiwassee is the place. Bring your own boat or rent one. Mountain View Marina is located inside the Bear Paw Community and is within walking distance. Bear Paw offers many activities that make it a great vacation spot. In addition to the lake activities, there is also an Olympic size swimming pool, basketball courts at the Pavilion/Club House, tennis courts, exercise room, children’s playground and a small catch and release fishing pond. All are within walking distance. No need to load up in the car….it’s all just a stone’s throw away. This comfortable vacation chalet offers…. hardwood floors throughout the house as well as central heat and a/c. For your enjoyment there are books, games, movies, DVD player, TV with Roku and Wi-Fi. 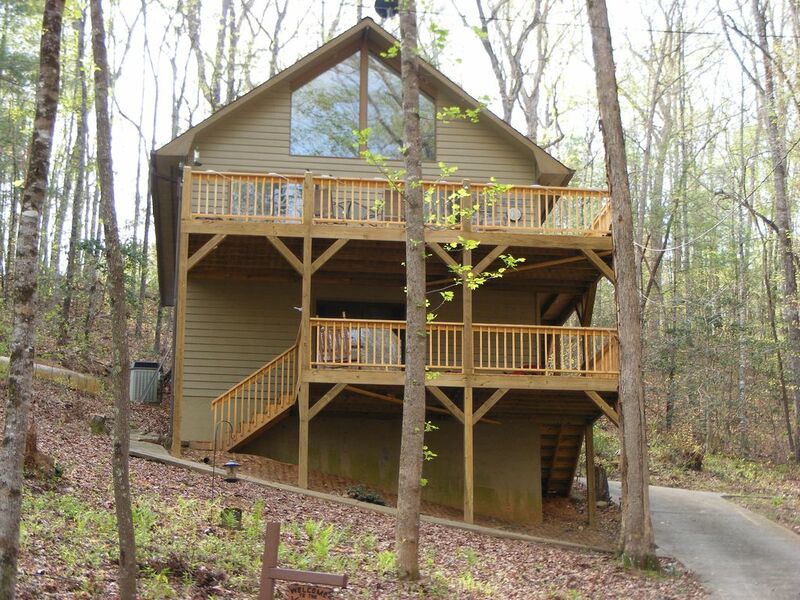 The main level has an open kitchen, dining & living room that opens up to a spacious deck. The 2 bedrooms (queen beds in each) and 2 full baths are on the main level. The open loft (2 twin beds) opens up to the main level. Down stairs in the lower-level there is a bedroom with bunk beds (queen on bottom, twin on top) & 1/2 bath with full size washer & dryer. There is a living room area with a 60" flat panel T.V., pool tale, ping-pong table and opens up to a another deck. The kitchen is fully equipped with stove, refrigerator, dishwasher, microwave, dishes, pots, pans and utensils. Everything you need to prepare a delicious country breakfast, romantic dinner, or holiday feast. There is an outdoor fire pit to warm you up on those chilly evenings or gather the kids for a marshmallow or wiener roast. Breathe in the clean mountain air and watch the hummingbirds feed as you relax and enjoy your morning coffee out on the spacious deck. Gather the family for a challenging game of “Corn Hole”, or fire up the grill for some mouthwatering barbeque. My husband and I live in Southwest Florida. We just recently purchased this home. We first visited Bear Paw about 11 years ago when my husbands parents bought their home here. We immediately fell in love with Bear Paw and knew we also wanted to own a vacation/retirement home here. We love spending our vacations here with our children and grandchildren. We have made so many memories here and look forward to many more. And we are glad to be able to give our guest the opportunity to do the same. Bear Paw is a very family oriented community with plenty of activities around. We love boating and water sports and the close and easy access to Lake Hiwassee. It is peaceful and quiet and everyone you meet is friendly. It is just a great community to be part of. We hope you enjoy it as much as we have and make tons of memories with your family and friends. We are new at this and certainly welcome any comments good or bad. We want to make it a place that you will want to return to year after year and recommend to your family and friends. Equipped with Roku which includes Netflix, Hulu, Vudu, etc. Debbie was incredible. She made the reservation super easy and was always available to answer my questions. The home is beautiful and very comfortable! We had a wonderful Thanksgiving here! The kids had a blast being with cousins and fishing. The only thing is the drive way!! We started calling it the Cardiac hill because it is so STEEP!! By the time you walk up it, you had your heart rate up!! Mrs. Hammond was great to deal with!! We are glad that you enjoyed your stay. Sorry about the driveway! It is a bit steep!! We hope you will consider staying with us again. Loved the place very much. We were out in the nature most of the day but it was a wonderful place to come back to for the evening rest! The kitchen was very well equipped and swimming pool, play ground, tennis court, basketball goals were short walk (though the pool was closed for the season etc). We enjoyed Turtletown Falls, orchard in Blue Ridge, visited small local church on Sunday (people were very friendly) etc. We loved this part of the country. Thank you very much for opening your home! Thank you for the great review. We strive to make our place an enjoyable experience for all who stay with us. We are thrilled that you enjoyed our home & hope you will consider staying with us again. The home, neighborhood and amenities were great! The home was just as pictured. All you could ever need was there. The beds and seating were all comfortable. The driveway is steep but had no problems backing a 15 passenger van to the top and parking it. We travel to this are often and will most definitely be renting the Hammond house again! Debbie is very quick to respond to any questions you may have as well. Thank you so much for you great review. We are always happy when our guests leave happy and with memories to share with others. Look forward to your visits again in the future!! Thank your for such a positive review! I am thrilled that you & your family enjoyed everything and look forward to you visiting us again! We enjoyed our stay. It was clean and well supplied. We were close to the pool which was huge and very nice. I liked being in a gated community. The driveway was very steep and has just enough space for one vehicle to park. There is room farther down the hill for other vehicles to park. We did fine, but senior citizens would have a difficult walking up the hill if they had to park there. I would recommend this house. Please contact owner for Rental Agreement and Check-in details Last minute reservations will be considered. Please contact the owner directly PETS.....Only dogs 50 lbs or less.